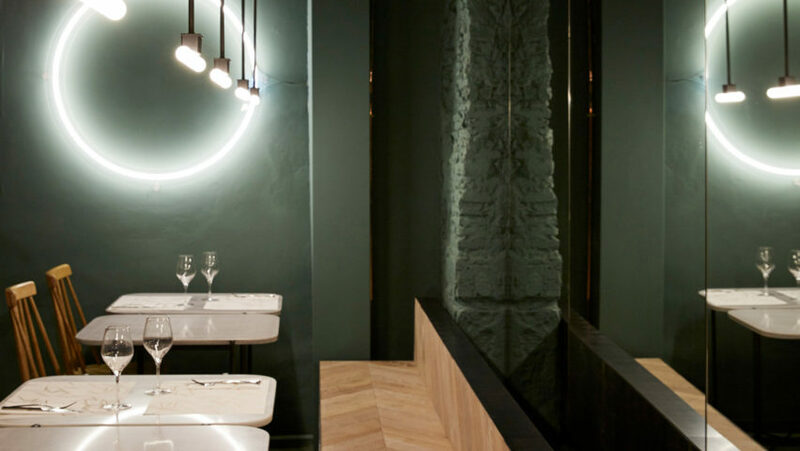 Vine-green walls and Merlot hued mirrors appear inside this Barcelona bar, which Isern Serra and Sylvain Carlet have designed in reference to the process of making wine. The bar – named Orvay – allows visitors to sample an extensive variety of wines, which served as a starting point for local designers Isern Serra and Sylvain Carlet to develop the bar's interiors. It developed a colour scheme inspired by elements of wine production, picking contrasting shades that could outline different seating zones. "We started with the idea of a 'game of colour', we wanted it to be the great protagonist of the space," Serra and Carlet explained. "We also liked the chromatic relationship that was generated between the three rooms, so there is no need for an element that separates them physically." Located in the El Born neighbourhood – an area of Barcelona known for its eclectic selection of eateries and drinking spots – the bar is sat close to 14th-century church Santa Maria del Mar and accessed via a medieval-era arcade. The false ceiling's in the bar's entryway – which features casual high counters and black stool chairs by Danish brand Menu – has been knocked through to reveal historic stone walls. These have been left exposed with the intention that their beige hue will remind visitors of the fertile earth of wineries. In the more formal dining area, surfaces have been painted deep green in reference to the verdant terrain of vineyards. This room has also been dressed with a long oak bench seat and tables topped with white marble. A separate dining room reserved for large groups has been completed in a pinkish hue intended to hint at the colour of red or white grapes. Decor throughout the bar has been kept to a minimum, excluding a handful of large, red-tinted circular mirrors that are supposed to evoke "looking through a glass of red wine". Earlier this year Zooco Estudio created a wine shop in Valladolid, northwest Spain, which features arched doorways and circular openings that are meant to mimic the curved form of wine bottles and the barrels used to store them. Photography is by Verena Galias unless stated otherwise.